I am somewhat obsessive about keeping track of recipes. The first thing I do when I find a recipe I like is type it into my computer. Years ago I used a great recipe program, but the software company didn’t keep up with upgrades to computers and operating systems and eventually they went out of business. I was crushed. As I was unable to find another program that I liked, I started using my word processor. It’s a bit tedious, but after much trial and error, I came up with a system for sorting my recipes so that they were easily accessible. I use a MacBook Pro, and with my Mobile Me account I was able to store my recipes on my iDisk. This made them accessible to me from my iPad or from any other computer once I logged into mobile me. Recently, Apple has chosen to eliminate mobile me in favor of iCloud, and in the process they have eliminated iDisk. I was told that the only way to access my recipes on my iPad was to email them to myself and keep them in my mail. There would be no way to sort the recipes. 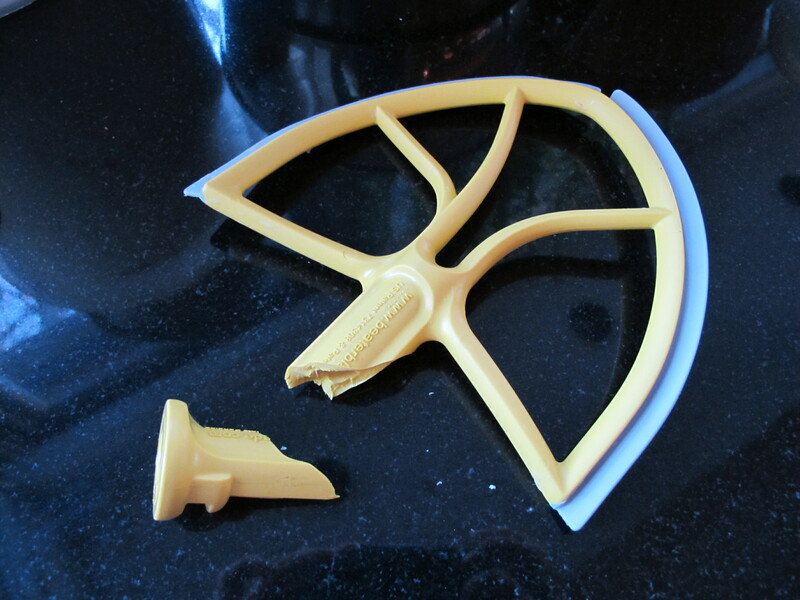 This was not at all practical, as I have over 850 recipes recorded. Thanks so much Apple! Someone at the Apple Store suggested that I use a recipe program and app for my iPad – said there were lots of them out there. I was somewhat skeptical because the last time I looked I couldn’t find anything that would work well for me. But what the heck, these things must be improving all the time, right? I did some research online and found what I think is a fantastic program called Pepperplate. This program allows you to easily enter your own recipes and see them in a professional format. You can add recipes from other websites, often with just a click of the mouse. ( You must add a bookmarklet to your bookmarks bar first. ) You can manage your recipes, scale the recipes, plan meals, create shopping lists and access everything on a mobile device. And did I mention that it is FREE? There are other great features, but if you are interested you should check it out. 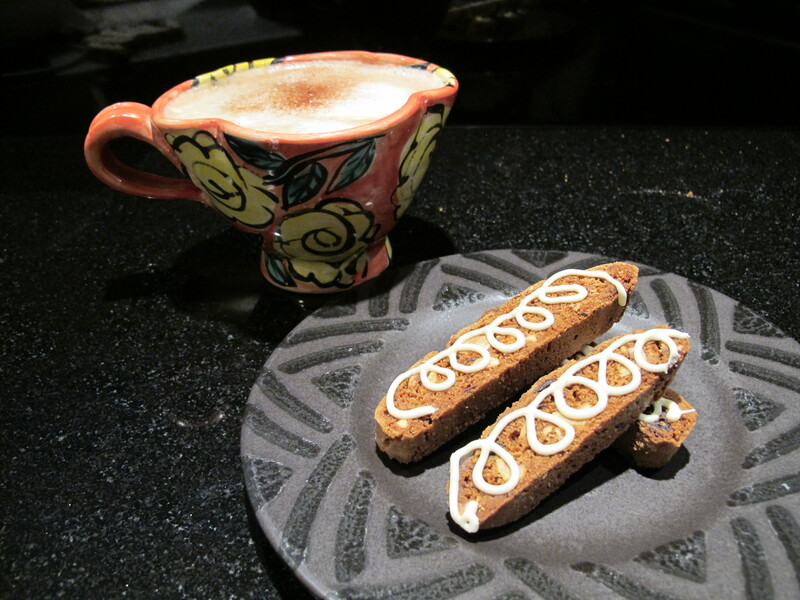 To celebrate using this website, here’s my favorite recipe for biscotti. The original recipe was published in Bon Appetit magazine in December 1998. I always fine tune recipes slightly, and rewrite the instructions so they make sense to me. Toast hazelnuts for 15 minutes at 350 degrees. Remove from oven and place in tea towel. Wrap up and place in plastic bag for 15 – 20 minutes. Remove from bag and rub in tea towel to loosen skins. (Can be done while nuts are warm or have cooled.) Chop coarsely. Position rack in center of oven and preheat to 325 degrees. Beat sugar and butter until fluffy. Beat in eggs 1 at a time. 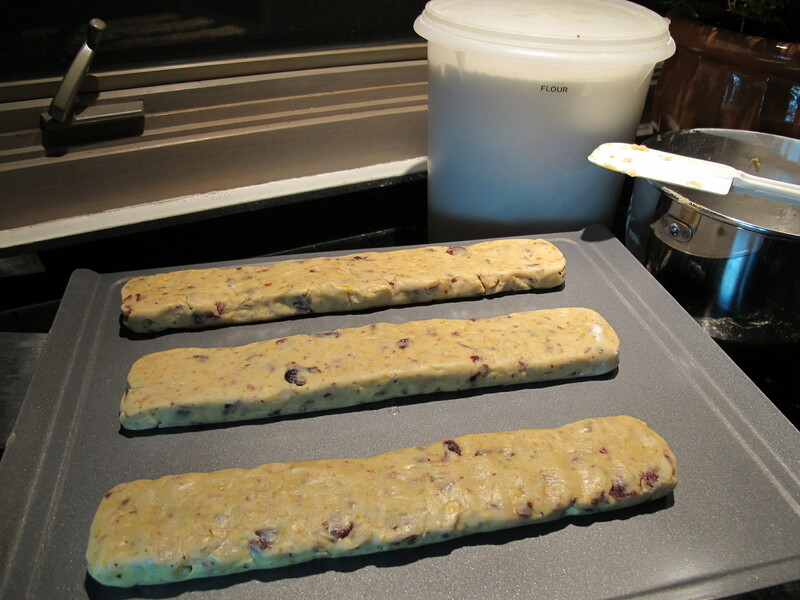 Mix in orange peel, hazelnuts, cranberries and 3 cups flour blended with baking soda and salt. Stir until well blended. Add most of remaining flour, 1 cup at a time, stirring until well incorporated. 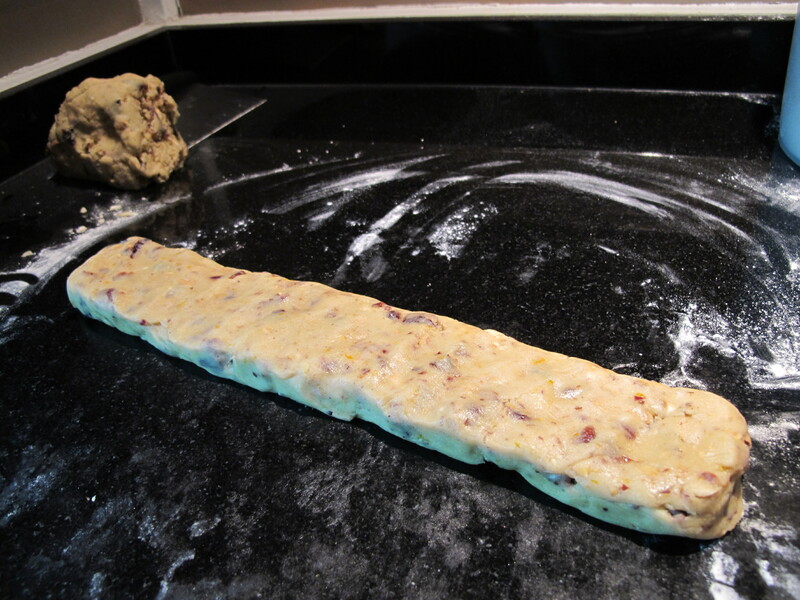 Transfer dough to floured work surface. Divide into 4, 5 or 6 pieces. Knead each piece until dough holds together well. Form each piece into 9″ x 2” or 3″ logs. Place 2 logs on ungreased baking sheets, spacing 3″ apart. Bake until logs are golden and feel firm when tops are gently pressed, rotating sheets halfway through baking, about 55 minutes total. Cool logs on sheets 15 minutes. Transfer logs to cutting board. Cut warm logs crosswise into 1/2 ” thick slices. 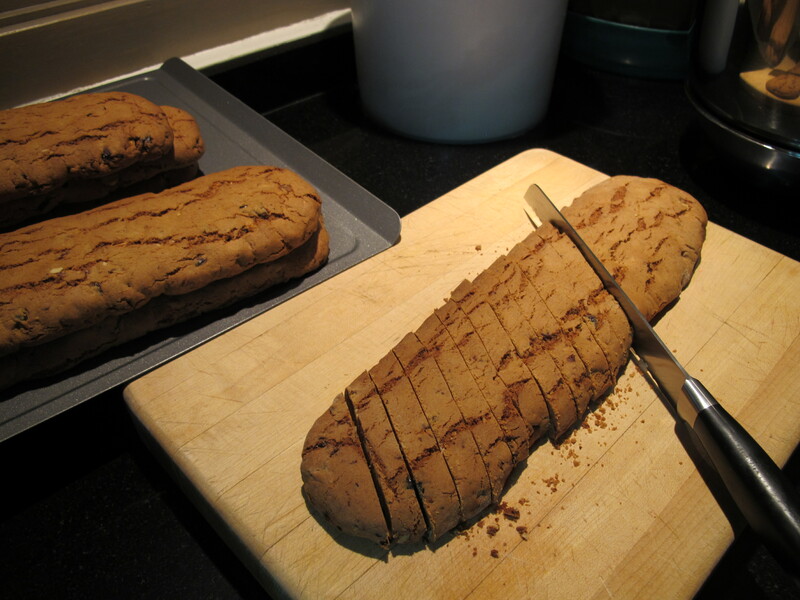 Arrange slices cut side down on two baking sheets. 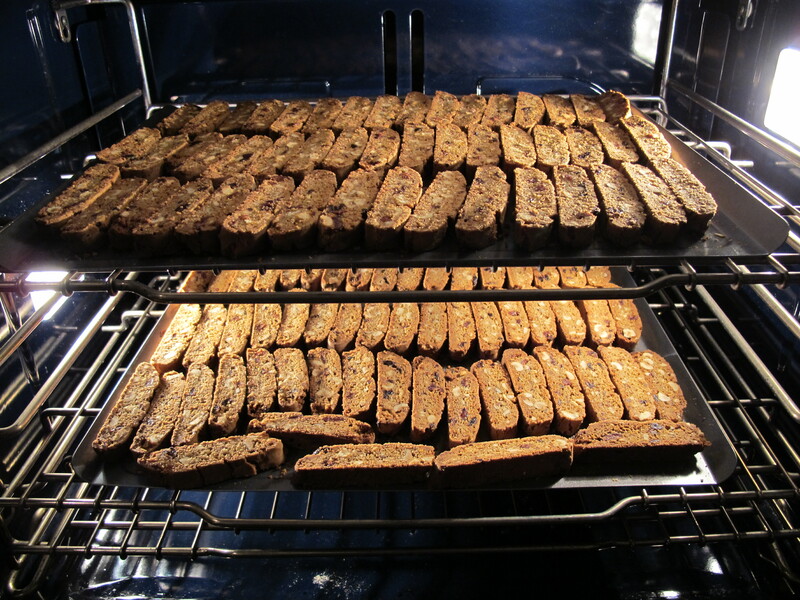 Bake biscotti 10 minutes, turn over and bake until light golden, about 10 minutes. Transfer to racks and cool completely. Melt chocolate, put in ziplock bag. Cut tiny hole in corner of bag and decorate biscotti as desired. Store in airtight containers or freeze. I’ll check but I don’t think I have any control over that. Have you gone into your reader, blogs I follow, edit, and then tried to delete the notifications on my blog? Let me know. If that doesn’t work, I’ll try to contact WordPress. Thanks for bringing this up. It must be very annoying! 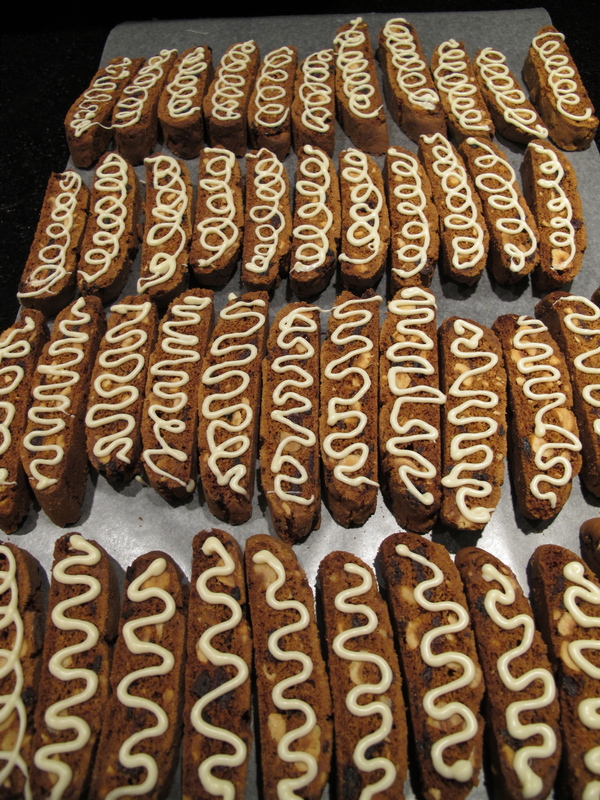 Yum, yum, yum – Terri the biscotti look amazingly good. I am going to check out the recipe app you recommended – thanks for the lead. Hope it’s not too long before your new beater blades appear. Keep baking and keep sharing the best of your best recipes. Thanks.